as Witness our Hands hereunto set October 18^th 1731. & Sufficient Freeholders of the said Town Greeting. office so soon as may be. Deceased Intestate according to their best Skill & Judgment. Plimpton their Ratable Parts thereof and of their Charges. Pounds each there being no Personal Estate to Satisfy the same. "Massachusetts, Wills and Probate Records, 1635-1991," indexed database with digital images, Ancestry.com (http://www.ancestry.com, : accessed 5 November 2017); Suffolk County, "Probate Records, V. 29-31, 1731-1734," Volume 31, pages 190-192 (images 671-672 of 858), John Plimpton, 1730, warrant, appraisal and distribution; Original images in Suffolk County [Mass.] Probate Court. John Plimpton (1680-1730) died intestate on 19 January 1730 with a significant estate in Medfield, Suffolk County, Massachusetts. He left a widow, Susannah (Draper) Plimpton, and four children, two of them over age 21 and two under age 10. Part 1 of this series included the Letter of Administration appointed the widow, Susannah Plimpton and the oldest son, John Plimpton as Administrators of the estate. 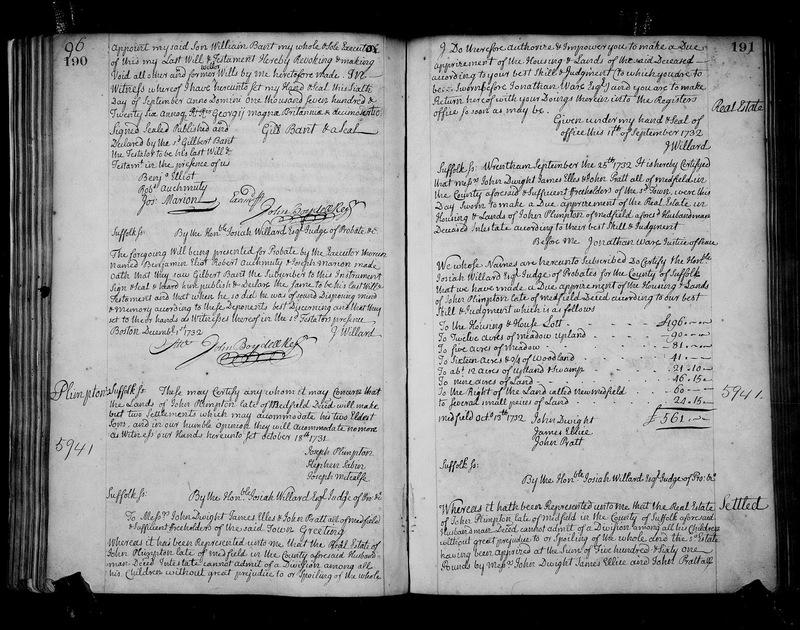 An inventory of the estate was taken on 10 March 1730, and totals £879-3-9, of which £567-10 is real estate. The Letter of Administration is dated 7 April 1730. 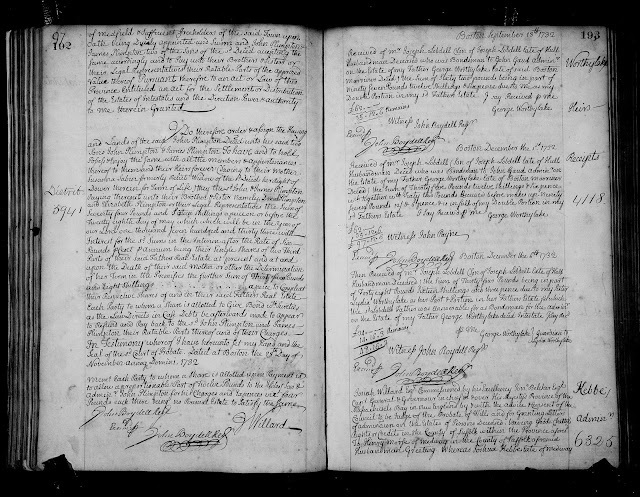 In Part 2, the Administrators presented their account, requested payment for their expenses, which was granted by the Judge of the Suffolk County probate court on 7 June 1731. 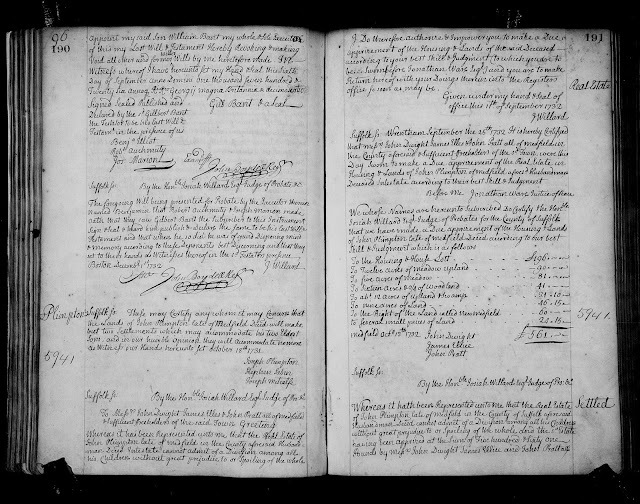 In this post, a warrant for the appraisal of the real estate was made, the appraisal was made, and the Judge of Probate approved the distribution of the real estate to the two older sons, John Plimpton and James Plimpton with a provision, reserving one-third of the real estate for the widow of John Plimpton. The provision was that John and James Plimpton were to provide 74 pound 16 shillings to their siblings Daniel Plimpton and Elizabeth Plimpton immediately, and 35 pounds to each of them when the widow, now remarried, died. James, Daniel and Elizabeth were to pay 4 pounds each to John Plimpton for his expenses administering the estate. How did the Judge come up with the amount to be paid Daniel and Elizabeth? There were four children of the deceased, who would eventually receive the entire estate. The eldest son was to receive a second share by law at the time. So five shares needed to be defined in order to split up the £561 in real estate. One share was thus 112 pounds, five shillings. Two-thirds of one share was 74 pounds, 16 shillings, and the remaining one-third is 37 pounds, 8 shillings. I don't know why the award for the widow's third was only 35 pounds, 8 shillings. An error by the judge? The distribution did not split the real estate holdings between the two eldest sons. Logic says that son John Plimpton held two thirds of it in value and son James Plimpton held one third of it in value. Did the two sons sell some or all of the land during their lifetimes? The eldest son, John died in 1756, and daughter Elizabeth died unmarried in 1757. The widow Susanna (Draper) (Plimpton) Sabin died in 1769. Presumably, John's children received his share of the land and James's children received his share. It gets complicated!